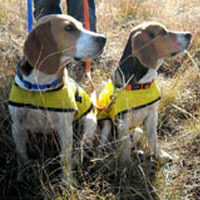 The purpose of this site is to provide centralized scheduling information relating to our field days (Gauteng, KwaZulu Natal and Western Cape), and to share photographs and other information about our wonderful hounds and their achievements in the field. The Beagle is an all rounder, excelling both as a show dog and as a master of tracking a scent and should be allowed to remain as natural as possible. Please note that we do not hunt live quarry. At no time do we ever let the hounds off after live rabbit or hare. In fact, the hounds are so conditioned to following the laid scent trail that, on the rare occasions where they have flushed live quarry, they have totally ignored them and carried on along the laid scent trail. In South Africa, we do not use artificial scent such as aniseed mixed in oil as we believe that our hounds should run on as natural a scent as possible. Our lure is generally made up of a mixture of pilchards and sardines. The aim of the drag hunting field days is to provide a controlled environment whereby we can let our hounds socialize and use their natural ability to trail a scent laid by the huntmaster. Beagles are after all a pack animal, and the need to form a group with a defined social hierarchy is very strong. They also love to run their little legs off! We hope you find our site informative. We also have a small variety of fun products for sale in our BeagleShop. 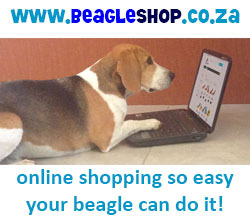 Beagles.co.za is not affiliated with any breeders. Please do not contact us with puppy enquires. 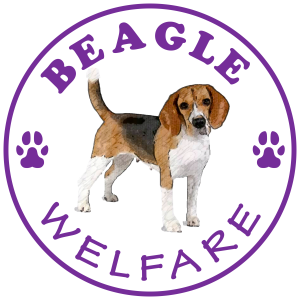 If you are looking for a beagle puppy, please post in our forum BeagleTalk or join our Facebook page where we have a thread for breeders and people from all over the country who might help. Some general points about Beagles: Beagles are hardy, sturdy squarely-built, small hounds. The Beagle has a sleek, easy-care, short coat, which can come in any hound colour, for example, tri-colour, black and tan, red and white, orange and white, or lemon and white. The coat is close, hard and of medium length. The head is broad and slightly rounded, and the muzzle is straight and square. The feet are round and strong. The black nose has full nostrils for scenting. Beagles have long, wide, soft ears. The brown or hazel eyes have a characteristic pleading expression – a face that is very difficult to say “NO” to! The tail is carried high, but never curled over the back. They are determined and watchful and require patient, firm training. It is important you are this dog’s pack leader and that you provide the proper amount of mental and physical exercise including daily walks or other forms of exercise. 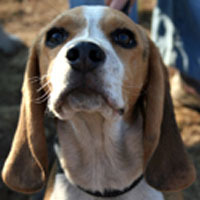 The Beagle has been used in packs, alone, and in pairs, for hunting hare, pheasant and quail. He has also served as an excellent narcotics detection dog (often seen at airports around the world) and makes a fine family companion. 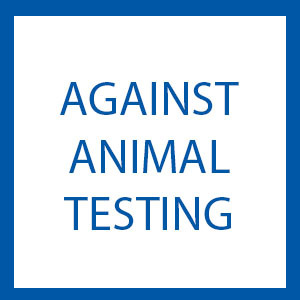 Unfortunately, because they are fairly uniform in size and small, Beagles are often used for medical experimentation. Our field days are held between March and October as these are the cooler months for the hounds to run in. Winter in the highveld poses somewhat of a challenge as the grass is very dry and the scent trail can be very light, however the huntmaster can gauge whether or not the hounds are finding the going difficult, and will make any changes necessary such as watering the lure to make the trail lie longer. We schedule our field days around the show calendar as we feel that the Beagle is an all-rounder and should be both shown and allowed to track. Correct conformation of the beagle is very important and you can really see the importance of various points of the breed standard when the dogs are in the field such as length of neck and well laid back shoulders. People who do not own Beagles are often intrigued by their tail which is held straight up in the air. Given the length of the grass that we sometimes work in, the very tip of the tail is often all you can see of the pack as they go about their business. It really is beautiful to see and hear the dogs on the scent, and makes the pain of getting up when it is one degree outside a little easier to bear! The added bonus is that when you get home, they sleep for hours, so you can have some quiet time to yourself. Is My Dog Too Young or Too Old? We do not recommend that you bring your puppy to field days before he/she is 9 months old as they are still growing and you do not want to stress their joints and they are also easily distracted. We do however have a number of veterans still working in the field (7+ years old). Although they are not as quick as our up-and-coming youngsters, they certainly add brains and maturity to the mix. Some years ago we had a hound over 10 years of age join us for the day, and they took off on the first line as if they had been doing it their whole life. Dogs younger than 1 will be allowed to run, but will not score any championship points for the season. How Do I Attend a Field Day?